Size: 2,100 sq. 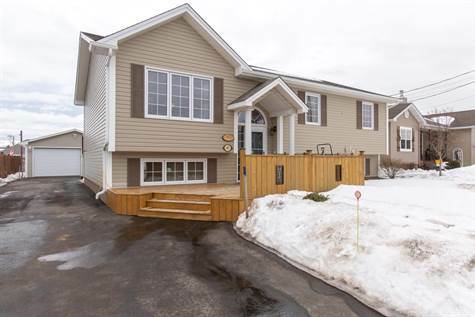 ft. "Finished"
Location, Location in sought after Moncton North in "Liberty Hill"! EXCELLENT FAMILY HOME all in one COMPACT & SMART spaced for less! Home features upgraded kitchen in 2017: New pull out drawers, new hardware, backsplash and CLEAN WHITE CABINETS. Has built-in dishwasher and microwave, double sink, 5’ island and beautiful porcelain tile Floors. MORE features are OPEN CONCEPT living room/kitchen/dining, 2 baths, large master bedroom with walk-in closet . THE main level bathroom has beveled glass shower door & a linen closet. DOUBLE FRENCH DOORS are inviting to LARGE BRIGHT FAMILY ROOM on the lower level. You will appreciate the 3-pc bath/laundry area. THE BEST FEATURE IS FOR SURE THE PLAYROOM LISTED CURRENTLY AS THE 4th BEDROOM ! Large wired garage with security lights, workbench and storage. Garden doors lead to 20x14 back deck with great backyard with your own clothesline. Front Deck is only 3 years old/offers space of 280 sqft to enjoy the sun all day long. NEW PAINTS throughout the home. Ductless heat pump installed for lower hydro cost. Built-in central vac, large Boston headers and trim, covered concrete step with pillars. Some furniture could stay.